Lazy Lasagna One Pot Lasagna is a busy parent’s dream come true. Toss all the ingredients into your dutch oven and bake – you don’t even have to precook the noodles! We make our lazy lasagna – one pot lasagna with Italian meatballs and like to serve it with two minute garlic knots and some steamed or roasted broccoli. If you’re not a meatball fan, there are infinite variations! I grew up in big Italian family, so there’s never a shortage of Italian recipes in our home! And for dessert, simple three ingredient peanut butter cookies are the way to go! My boys ate this so fast the first time I made it that there wasn’t even any left over for my husband. Needless to say, Lazy Lasagna has become an absolute staple in our home. What is good to go with lasagna? Lasagna tends to be a heavy dish – all the cheese, and pasta – it’s delicious (oh, so delicious), but definitely heavy. To offset that, we like to server our lazy lasagna with a big green spinach salad or a lighter vegetable, like roasted broccoli or asparagus. I also like to have a bread on the side to sop up all that delicious sauce. Our two minute garlic knots or 30 minute dinner rolls are a great choice! If you’re feeling a little more ambitious, this easy beer bread is ahhhhhhmazing. Where does the name of lasagna come from? What is the difference between lasagna and lasagne? As we stated, lasagna is not only the name of the dish, but also the name of the noodle used in the dish. So if you’re referring to a single noodle, it would be a lasagna, but if you’re referring to multiple noodles, they would be lasagne. 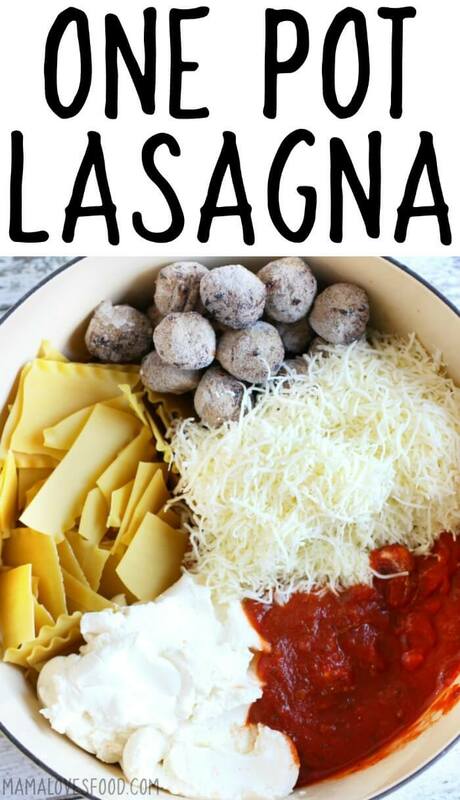 How do you put together a lasagna? Traditionally a lasagna is a layered casserole dish. You would start with par cooked lasagna noodles, then layer sauce, cheese, and sometimes vegetables and meat. Repeating until the casserole dish is full. The dish is delicious but very time consuming. With our lazy lasagna method you get the same amazing flavor result using only one pot, no precooking the noodles, and in a fraction of the time. I will literally never make lasagna the old fashioned way again. And I feel confident that my Italian grandmother would be just fine with that! 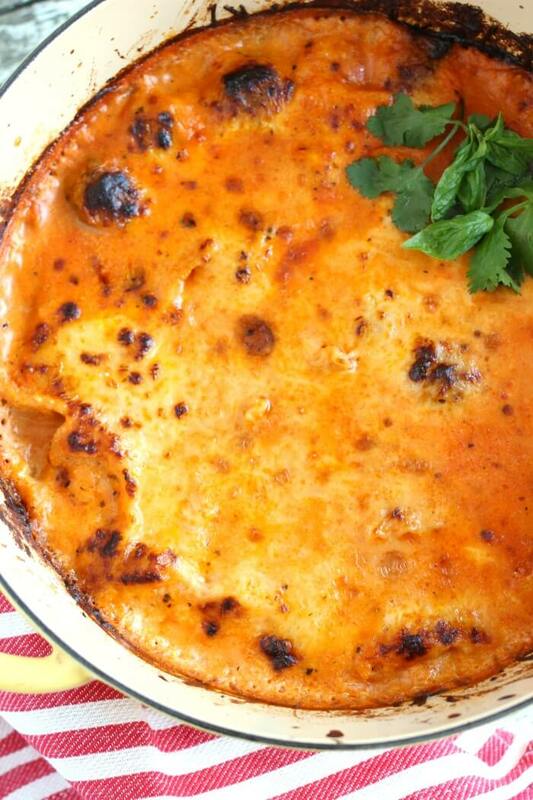 Is lasagna good for your health? Lasagna is good for your soul. This one pot lasagna is about as comfort food as comfort food gets, but I can’t say I’d recommend it if you’re on a weight loss plan. Maybe for a cheat day! Or if you substitute the lasagna noodles for zucchini noodles, that would go a long way toward making it better for you. The ingredients for our one pot lasagna can be super simple with all premade ingredients, or you can go for a fully from scratch meal. This is totally up to you and I know it will be delicious whatever way you choose to go. 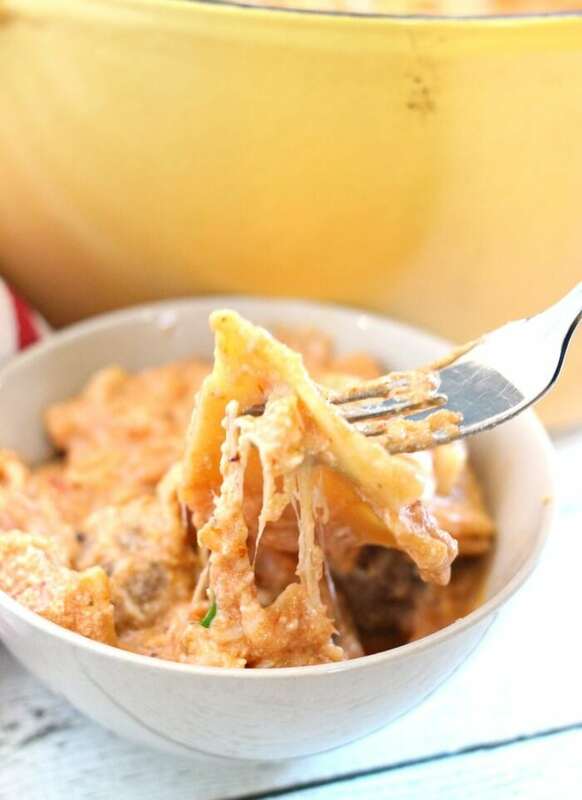 Lasagna noodles – We used regular lasagna noodles from our local market. Even though we don’t precook our noodles, you do NOT need to purchase the no-bake version. Trust me on this, save your money and just get the regular kind. Spaghetti Sauce – Again I used a jar from the grocery store, but if you want to try your hand at making it from scratch we have a delicious slow cooker spaghetti sauce recipe or a super simple blender spaghetti sauce recipe! Ricotta Cheese – If you’re going to eat lasagna, go ahead and go full steam ahead with full fat ricotta cheese. It will make such a difference in the end flavor of your dish. Mozzarella Cheese – Same as with the ricotta cheese. If you’re going to make a delicious comfort food like lazy lasagna, do it right. Get the full fat cheese. And if you have the time, go ahead and shred your own. It really does taste better. 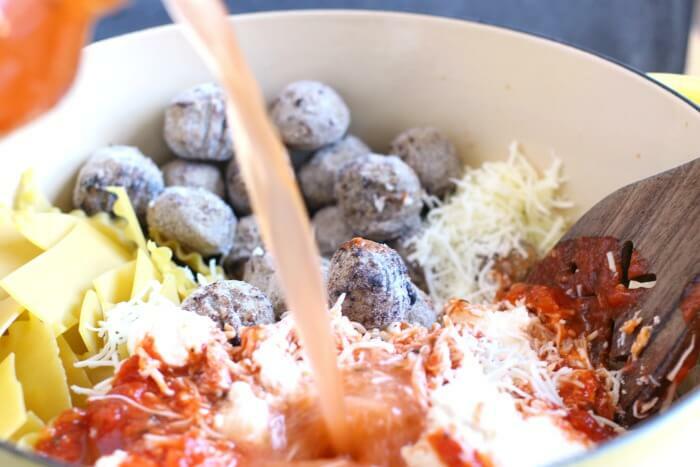 Meatballs – I totally cheated and threw in a bag of frozen Italian meatballs. It worked perfectly and we didn’t even need to defrost them. 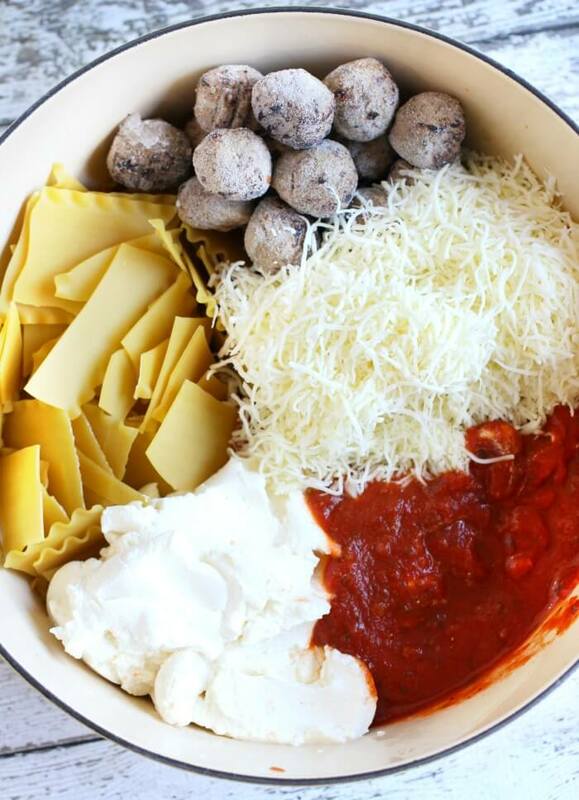 If you want to make your own, we have this yummy recipe for turkey meatballs you could try! We used a bag of frozen meatballs in our lazy lasagna recipe, but that’s just one of so many ideas! 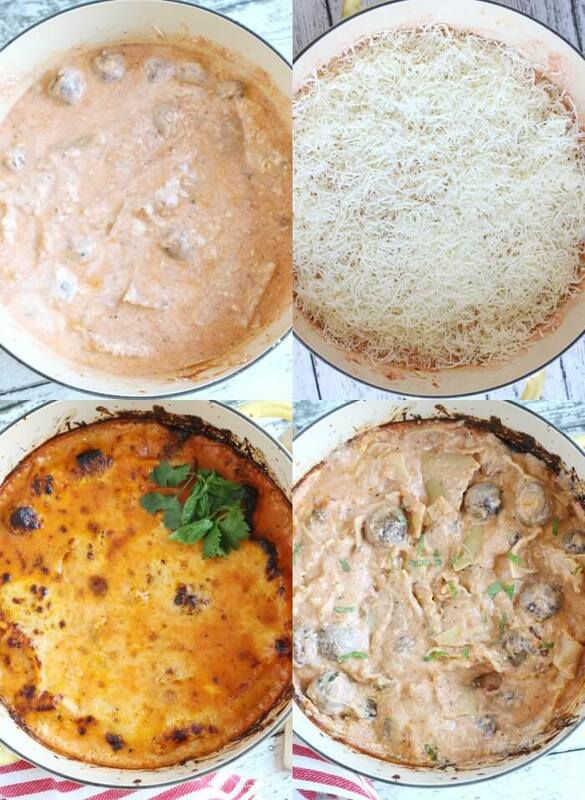 Try these other add-ins to make your one pot lasagna unique! 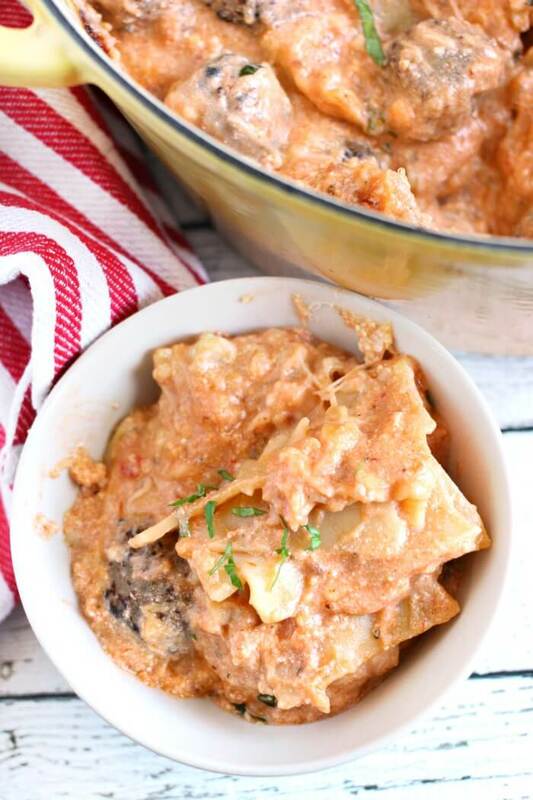 Slow Cooker Italian Chicken Stew – While our lazy lasagna recipe is not super healthy, this Slow Cooker Italian Stew is super duper healthy. And definitely not lacking on flavor. If you’re looking for a guilt free option, you’ll love it! 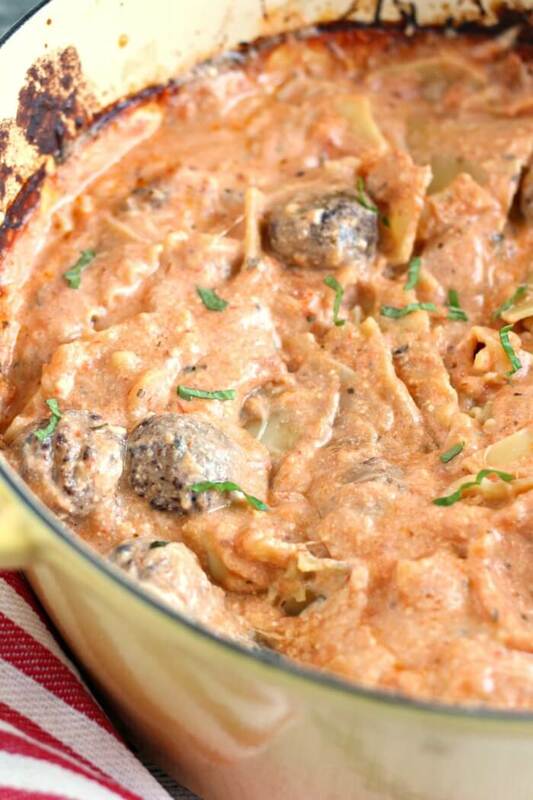 Cheesy Tortellini & Pesto Chicken Casserole – Another super simple Italian casserole recipe! This will be a regular on your meal rotation in no time. My husband is an especially big fan of this pesto tortellini casserole. Pepperoni Pizza Baked Ziti – It’s two delicious Italian recipes rolled into one! And totally easy to make! My kids think our pepperoni pizza baked ziti is hilarious because it’s not really what it looks like! Sausage and Peppers Flatbread – When my husband and I first were married, we would go out to dinner with my Italian grandparents a lot. Almost always to hole in the wall Italian restaurants, where inevitably my grandfather would order something not on the menu. Often a dish of sausage and peppers. This flatbread recipe always makes me think of him and smile. Enameled Dutch Oven – One of my favorite things in the kitchen. This one from Lodge has over 5,000 five star reviews! I strongly suggest a dutch oven that is at least 6 quarts. And colorful! Oven Mitts – As seen on pretty much every live show! These colorful oven mitts are my very very favorite! You can also watch us make this One Pot Lazy Lasagna on YouTube! Make sure to tune in for all our live cooking shows! Lazy Lasagna One Pot Lasagna is a busy parent's dream come true. Toss all the ingredients into your dutch oven and bake - you don't even have to precook the noodles! Add everything except 2 cups of shredded mozzarella to a large broiler safe pot or dutch oven. We used a 6.5 quart enameled cast iron dutch oven. Stir everything together, it will be watery, don’t worry. Sprinkle remaining cheese over top. Cover and cook at 375 degrees for 45 minutes. If your meatballs are frozen, you may need to add an additional ten minutes of cook time. Remove cover and turn on broiler until cheese browns and crisps a little. Watch closely so it doesn’t burn! Remove from oven and stir. It will seem a little watery at first, but let it rest 3 - 5 minutes and it will be perfect. My kids devoured the entire pot for lunch! Hi there. Can you use cottage cheese instead of ricotta? This recipe sounds wonderful but I’m a little confused on the two cups of mozzarella cheese that you save. Is that to put on after it rests? I love that it can all be done in one pot so less clean-up! Looks so good! I am lazy and I love lasagna. Double score ,this is fabulous! Can you make it vegetarian by cutting out meatballs and adding veggies instead…also would I need to lower the water content and cook time if I did this? yes, and yes 🙂 i would lower the water by about a fourth. How would the Dutch oven cooking instructions translate to an instant pot? Any ideas? I would like to add fresh spinach to this. I was wondering about not adding the 2 cups of mozzarella during the 45 minute bake, removing the pot from the oven and stirring in the spinach, while the broiler heats, topping with the remaining mozzarella then broiling. This would wilt the spinach in the jot sauce without overdoing it? What do you think?